The piece “Mining Review empowering news vendors” featured below was initially published in Malawi’s Mining Review Issue Number 22 2015 that is circulating this February 2015. The full edition can be read here: Mining Review No. 22 February 2015. To learn more about this quarterly publication, edited by Marcel Chimwala, read the post about the “Voice of the mineral sector in Malawi”. 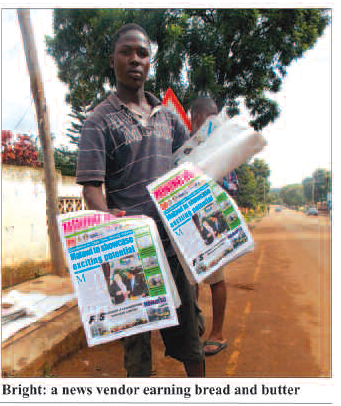 As one way of recognising and appreciating the integral role news vendors play in dissemination of published information, Mining Review management thought of coming up with an initiative whereby news peddlers are given the copies of the publication that sells at K200 free of charge, providing them with a rare opportunity of generating income for their respective households. According to the Publication’s management, the idea was hatched with the sole reason of empowering news vendors who spent long hours on the street distributing the all important news material, complementing other equally important channels of information. said Mining Review Publishing Editor Marcel Chimwala. He also advised others in the industry not to take the importance of the news vendors for granted, as without them, no publication would reach all corners of the country. He said the system has encouraged the vendors to aggressively market the publication as theirs in anticipation of earning the K200s. One of the beneficiaries of the intervention Chipiliro Bright, who sells various publications in one of the streets in Lilongwe said what the management of the only mineral sector monthly magazine has done is really helpful in improving the welfare of the vendors. Mining Review focuses much on positive and promotional coverage of Malawi’s growing mining sector with the aim of informing the public, investors and the authorities about the developments in the sector. The local publication was established in 2009 as an annual newsletter for the minerals sector. It was produced twice in 2011 and later evolved into a quarterly in 2012. Currently, the magazine comes out monthly with its coverage, in terms of area of distribution and number of copies produced increasing by every edition. Mining Review appears on Mining in Malawi website http://www.mininginmalawi.com courtesy of a working arrangement that the publication has with the owner of the blog.